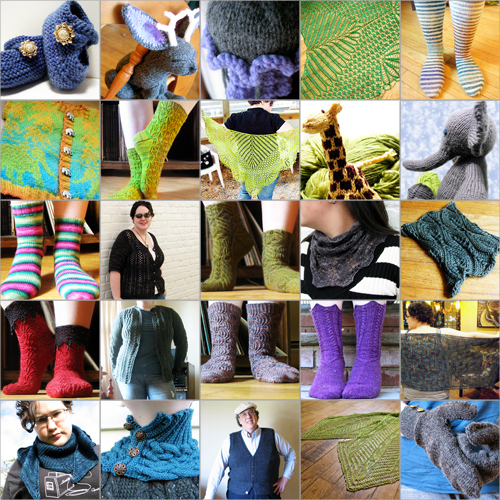 Eight pairs of socks, four toys, five shawls, four sweaters, three cowls, and one pair of mittens. Who thinks I can beat that, next year? Yarn? I don’t know what you’re talking about. There’s no yarn here. Hey, did you guys know that there’s this machine you can buy and you put, like, wool and stuff in it and turn the handle and it blends stuff together and makes really awesome rolls of super fluffy fiber? I’m pretty sure you didn’t know this. I’m pretty sure I invented it. Because it’s the greatest thing ever. And I need to get back to it. If you don’t hear from me for a while it’s because I’ve been eaten alive by my fiber stash. Don’t send help. The word ‘skeuomorph’ refers to no longer necessary features on things that are retained for decorative purposes, like rivets on jeans or the sound of a shutter click from a digital camera. These mittens have no such features. But I couldn’t resist naming them Skeuomorph, anyway, because it’s just such a delightful word. 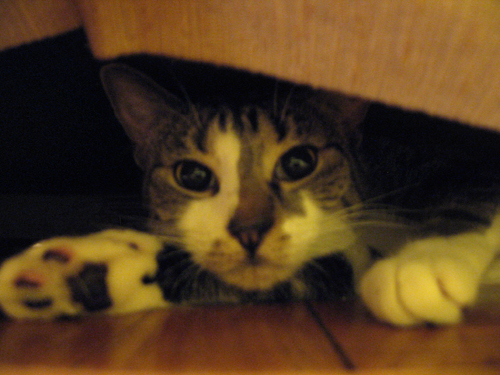 Plus, the sound makes me think of twisty, sideways things, and the mittens definitely are that. The east coast is getting snowed in, and although it hasn’t started here in northern New Jersey yet, I’m already preparing to spend the rest of the weekend indoors with lots of cocoa and some new pattern math. I was going to keep this whole project a secret, but now I don’t think I will—mostly because it’s too funny not to share. Look! It’s a manta ray! Heh. Just kidding. 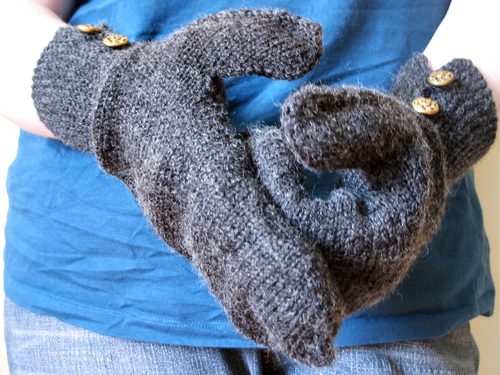 It’s actually… a mitten. 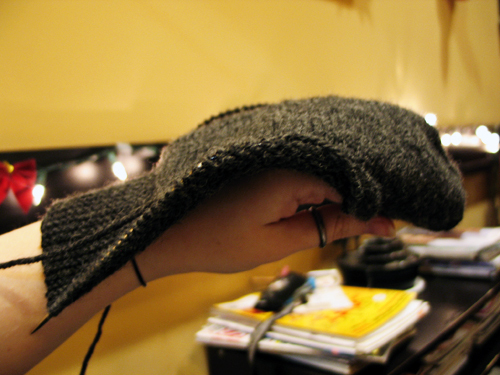 A sideways mitten. 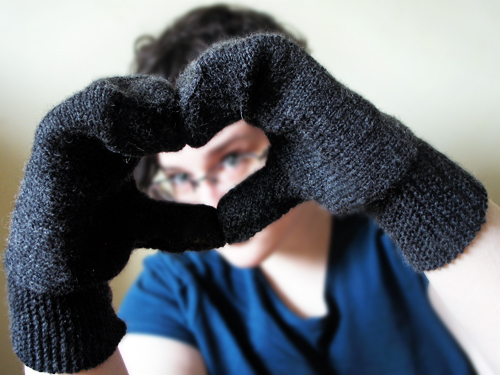 I don’t know what I was thinking when I decided that regular up and down mittens just weren’t good enough, but now that I’m working on this idea I’ve found that I really can’t leave it alone. Still waffling back and forth on whether or not there will be an official pattern, since these are so tricky and the specifics of how to shape them can vary widely depending on hand width, finger length, and other factors. Still, I figure if I take good notes (see above re: pattern math), then I’ll have something to show for it, either way. 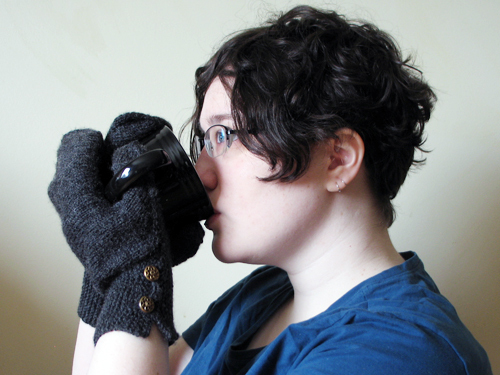 You know, I bet knitting sideways mittens for Oolong would be a lot easier. Is lots of tiny, sharp, metal teeth! I’ve had this carder on layaway since, um, July? And I finally got to pay it off with my Christmas money. I will, of course, have to go spin this batt. For educational purposes. Yes. Don’t look at me like that!! I promise this is the last of the FO parade for now—I’ve just been finishing so many things recently! Unfortunately I think, after finishing thirteen projects in four months, my knitting mojo has given up and died. I hadn’t knit a stitch in days and when I tried to get back to it this evening, nothing I tried was working. Oh well, I’m sure it’ll come back eventually. In the meantime! 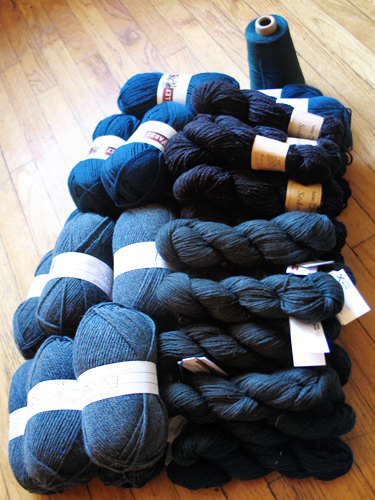 I have some tasty new yarn to fondle. 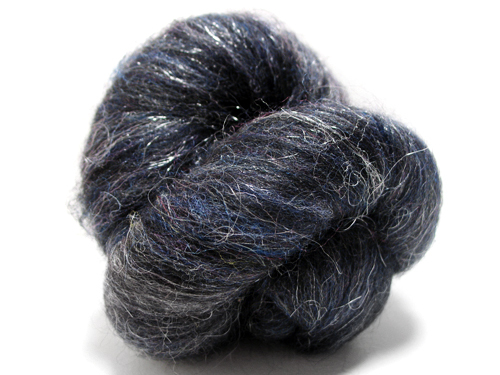 This is the three-ply cormo I’ve been working on for, um, ever. Well, like a month; I really don’t sit down at the wheel as often as I’d like. But I finally worked up the energy to ply it and I’m glad I did, because despite some violent disagreements with the wheel (noise making, driveband throwing, driveband breaking, among other things), the yarn turned out gorgeous. 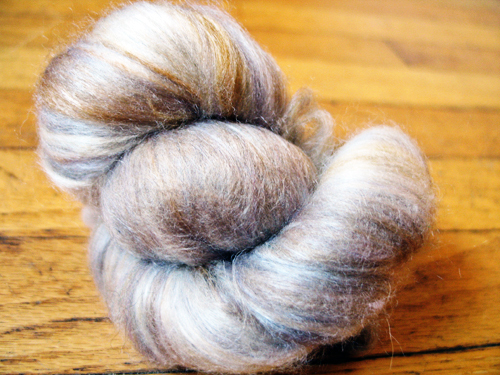 It is squishy and fuzzy and light and pretty much everything I’d hoped for when I started spinning it. 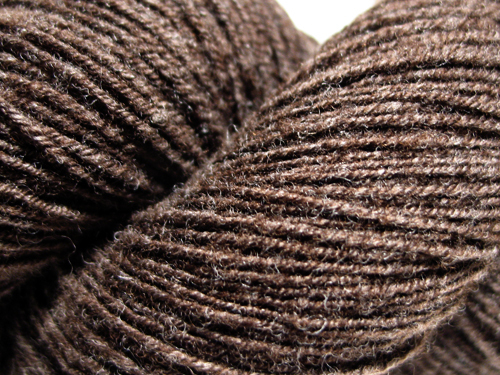 As far as I’m concerned there’s only one downside to this yarn: it’s brown. Now, while I have nothing against brown yarn in theory, in practice, well… I have brown hair in the exact same shade as this yarn, which means using for a hat or a scarf is right out. I don’t want to look like I’m wearing my own hair! 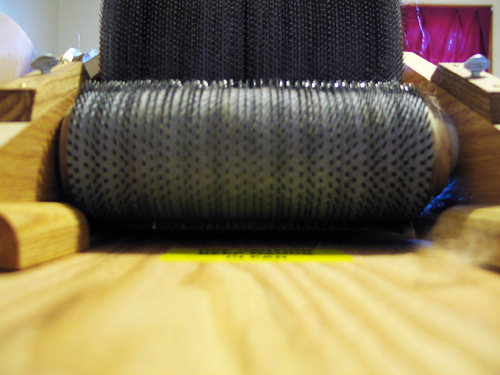 It is sock weight, and I considered knitting socks, but I’m pretty hard on my handknitted socks and I’d be concerned about it holding up, long term. So what’s a girl to do? 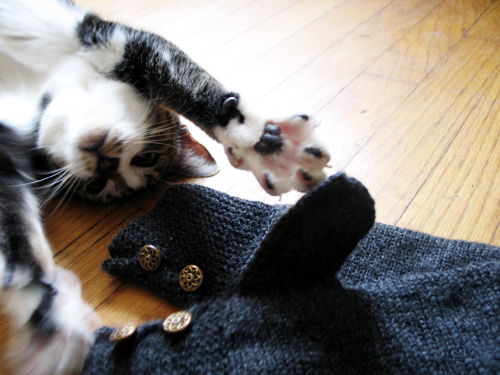 We’ll see—right now I’m considering gloves but I can’t seem to find the inspiration (see also: no knitting mojo). I also polished off that silk scarf I was working on the other day; it was a happy little diversion while I was waiting for the extra yarn to finish my dad’s vest. 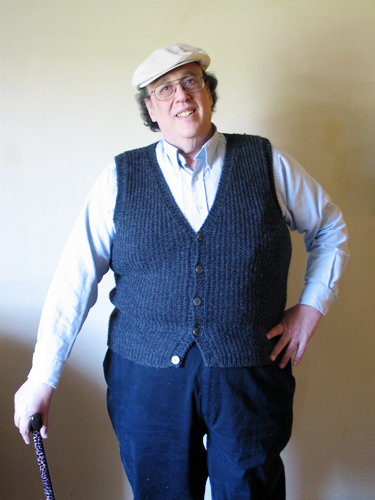 Notes: I don’t have much to say about this because it was such a straightforward, mindless knit! 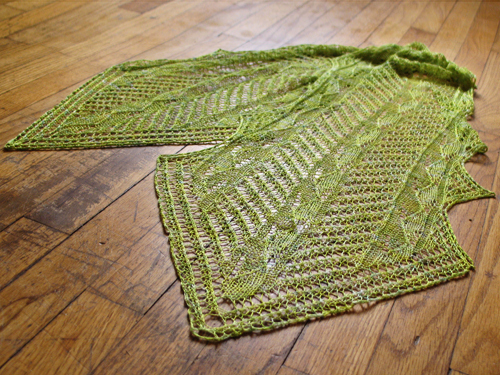 I only knit to eight repeats of chart two because the silk was so stretchy and I was getting bored. And that’s all I’ve got! 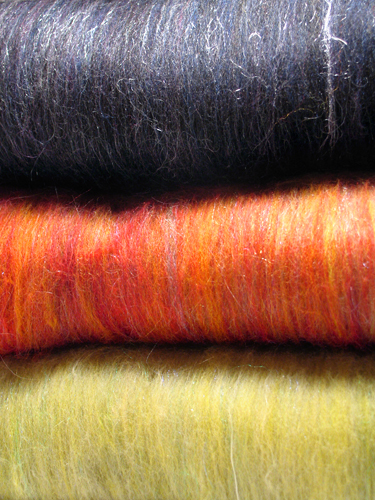 Maybe I’ll take a knitting break and try to get some spinning done while waiting for my mojo to return. Well yeah, dad, but what you do want? 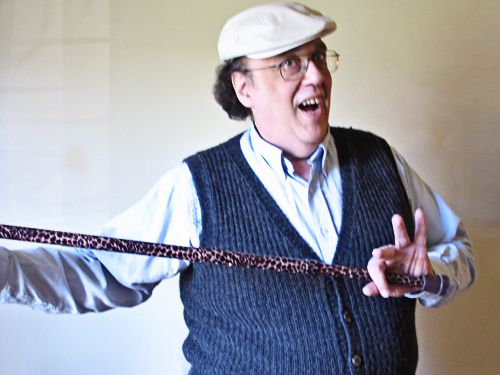 Recently I’ve taken it as a bit of a personal challenge to try to find gifts that will amaze and delight him, like the Hamlet bow tie he received for his birthday this year. It was perfect because he teaches high school English and, in addition to spending a lot of time covering Hamlet, he only ever wears bow ties to school. (I’m sure he also spends a lot of time cringing at the grammar on this blog.) In fact, it was almost a little too perfect; I knew I had to go far above and beyond to improve on that. 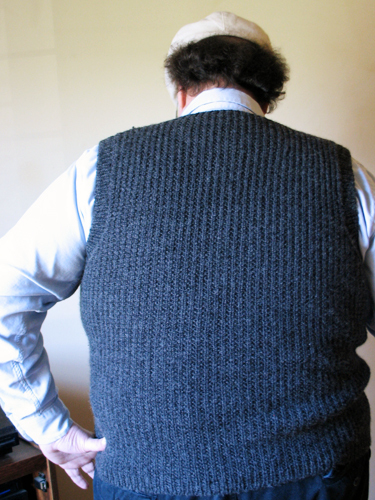 I knew I would have to… knit a sweater vest. It was nearly impossible for me to keep this a secret. 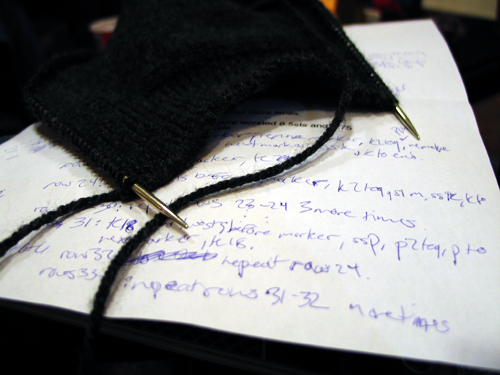 Every time I struggled with something (like running out of yarn) or managed something clever (like the 320 stitch tubular bind off around the button and neckbands, no I’m not kidding, yes it took me four hours, no I never want to do another tubular bind off again), I desperately wanted to blog about it. 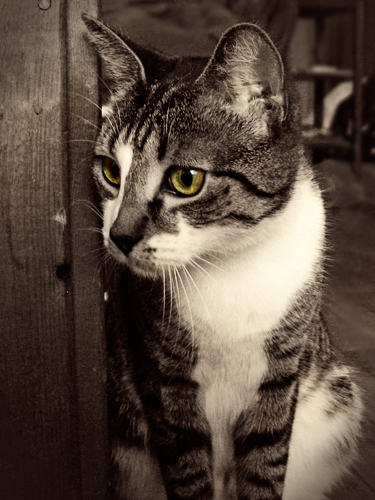 But—see above about my dad reading this blog. (Hi dad!) And saying anything would’ve ruined the amazement and delight, I think. So I kept my mouth shut. Er, mostly. And I’m glad I did. He was, in fact, speechless, and with luck he’ll get many years of wear out of just a few days of work. There’s nothing better than that. Actually, wait, there is something better: it’s superwash. 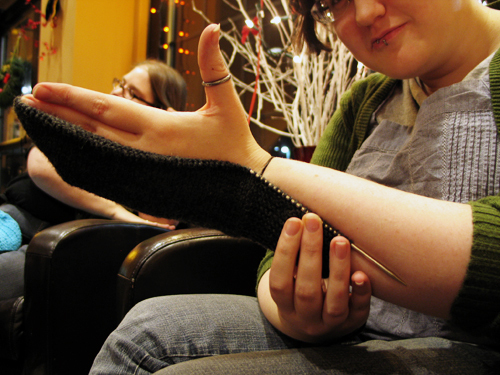 Notes: Do not be like me and try to attempt tubular bind off on all the ribbing. Save your sanity. Don’t. Do it. 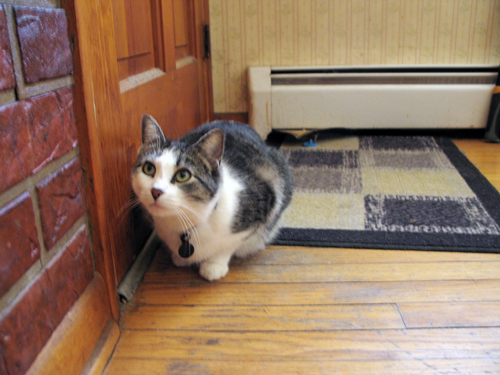 And since you’re always asking me about Caturday, dad, here you go!